One particularity about cylinder reproduction is that the recordings were made at many different speeds. In many cases the best speed adjustment is done simply by listening to the recording and adjusting the speed until it sounds good. There are, however, a set of speeds that were standard speeds at a given point in time. The most common is 160 rpm, used by the industry from 1902 on. 140 rpm was used in 1900 and 1901, and 120 rpm can be used as a guideline for earlier music recordings. Other recordings, such as speech and ethnographic field recordings were often done at slower speeds, down to 60 rpm. But even if your ear will be the final guide, it is good to have a starting point, to begin listening at a known speed. The simplest measuring device is a stroboscope, but they will not be readily available for the odd speeds we need to work with cylinders. We will be best off making our own stroboscopes, for the speeds we choose. I will here present some freeware programs that will do the work. First a word of caution and an explanation: it is not possible to make a stroboscope for every rotation speed. Stroboscopes work because our houshold electricity is not a steady stream, but moves back and forth, what we call alternating current or simply AC. In Europe the current oscillates at 50 Hz, which means that any lamp connected to this current will blink 100 times per second. In North America the figures are 60 Hz and 120 blinks per second. Using incandescent light this effect is not very strong and we do not normally notice it. But if we rotate a disc with evenly spaced black and white bands, we will notice a very particular effect: at a certain speed, the bands, albeit blurred, will appear to stand still. This is because they have moved exactly one step between two blinks of the light we use. So we only need to know the current frequency and the number of bands to know at which speed they will appear to stand still. At 60 Hz, 60 black and white bands stand still at a speed of 120 rpm, 50 bands at 144 rpm and 45 bands at 160 rpm. That works well for phonograph speeds. But at 50 Hz things are different: 50 bands stand still at 120 rpm, 42 bands at 142.86, the closest approximation to 144, and 160 falls between two nubers of bands; 38 bands at 157.89 rpm and 37 bands at 162.16. This Windows program is very easy to use. You begin by choosing the frequency of the current you use, 50 Hz or 60 Hz. Then you choose the rotation speed, either among the fixed speeds offered, or more likely by entering your own chosen speed after clicking Rotation > Other. Available speeds range from 10 to 1000 rpm. The result immediately appears on screen and can be printed by clicking File > Print. The image may look a bit coarse on-screen, but prints beautifully. The printed image comes out rather big, and if you want to change its size, you will have to do that with your printer software. There is no way to export the image and work on it in Photoshop, for instance. And you can only make stroboscopes for one speed at a time. Also, beware that the progam always tries to make the exact number of bands required for the speed you request. So if, for instance, you ask for a stroboscope for 50 Hz, 160 rpm, you will get it, but it will come with a white double space at the top. This happens because the program sets out placing the bands along the circle trying to put in 37.50 bands. 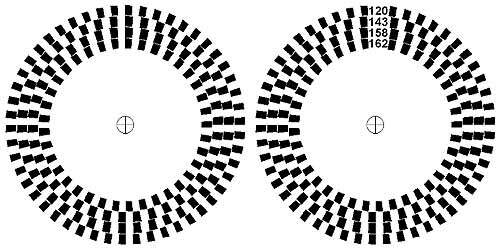 So when the circle is complete, the number of black and white bands does not sum up to an integer. When using this stroboscope, it will appear to stand still at the specified speed, but it will make a jump once every revolution, making it hard to really see if the speed is correct. This is a DOS program that will produce stroboscope discs with up to five speeds each. After download, place the program in a directory, in this case C:\phono. Open the DOS prompt, go to that directory and write strobe and up to five numbers of fields with a space between them. The number of fields has to be an integer, as this program only makes correct stroboscopes. The first number you write will make the outer ring, so begin with the highest number. Press return and the program produces a bitmap that is saved under the name strobe.bmp in the same directory. The stroboscope is not seen directly in the program. From there you can open the image in Photoshop or whatever image editor you use, change its printing size, add rpm numbers etc. Below left is the result of the commands seen above, and to the right the same image with rpm numbers entered, to the nearest integer. Note that the two inner rings are labeled 158 and 162 [rpm] respectively. 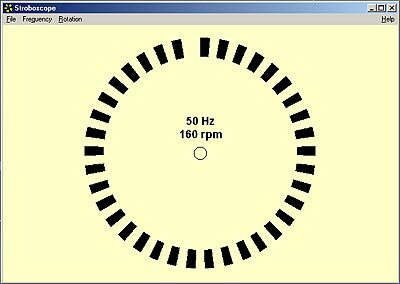 In a 50 Hz system there is no number of fields that will give a speed of 160 rpm, so I took the two nearest and adjust the mandrel speed so that the two rings appear to spin in opposite directions at the same speed (2 rpm).